The most magical Christmases in my memory have been the ones where the people, the conversations, the laughter, and the love stand out above any of the gifts I gave or got. It’s for this reason that I believe having a budget can truly enhance our Christmas spirit and our appreciation for special Holidays with those we love. The budget forces us to get creative… and oftentimes, it results in more “together” time because we’re choosing to play a game at home rather than go out to a movie theater or shopping mall. 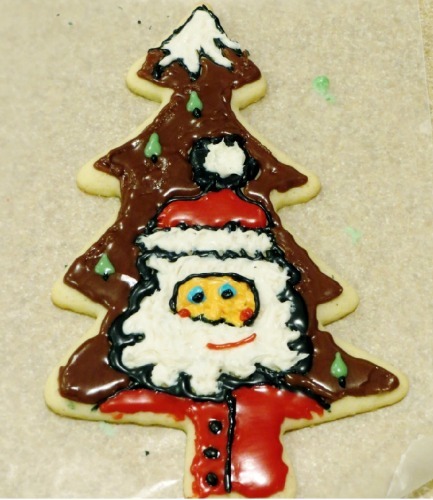 One year in particular, I organized a Cookie Decorating contest. I had found a huge Christmas tree cookie cutter at a thrift store (for FREE!) and it became the centerpiece of our (now annual) Christmas tree decorating contest! I baked up a big batch of cutout sugar cookies ahead of time (1 tree per person), and everyone contributed decorations and icing. We then had a big decorating party! The idea was simple. 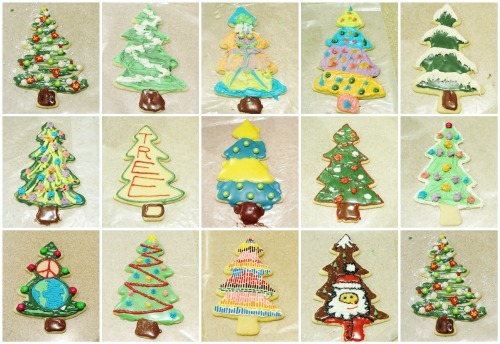 After everybody in the family (young & old) had decorated a tree cookie, we then took a picture of each tree and posted the photos in a public album on Facebook. We asked people to “Like” any/all of the trees they thought were good. And at the end of the voting period, the tree with the most “likes” was declared the winner! We all loved looking at each other’s creative ideas, and it was nearly impossible to choose a favorite! 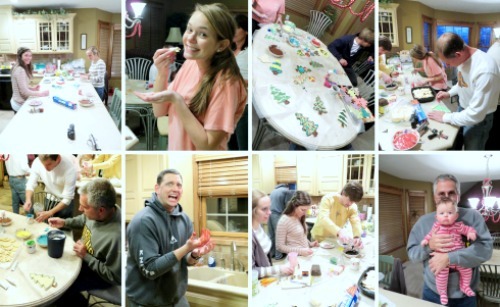 But even better than the lovely finished cookies, was the time we all spent together working on a common activity. Many of us have gotten married since that year, which means we’re rarely all together for the same holidays anymore. That makes the memory of decorating those cookies together all the more special. I will never forget the fun of that Christmas! Carissa is a wife and mother of a sweet 1-year old girl. She loves the Lord, her family, and cooking! In recent years her family has made drastic cuts to their budget in order to start saving to build a home. Carissa blogs at about all her kitchen creations! And don’t forget that you can get any MP3 song of your choice for just $0.05 right now! Download from Life… Your Way. 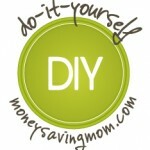 Mindy shows you I love this idea because it’s unique, consumable, and inexpensive. I may make some for us–and to give as gifts! Jessica from Life as Mom has a you can download. This ebook includes some of Jessica’s favorite ideas, recipes, and planning pages for Christmas. Looking for more handmade Christmas ideas? Check out the Simple Christmas ideas posted last year. And don’t forget to submit your Handmade Christmas tutorials for our upcoming series if you’ve not done so already.